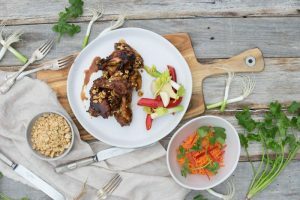 Carmelised chicken winglets with dark beer, miso, peanuts & pickled carrot slaw. To make the miso marinade, whisk the beer, miso paste, soy, fish sauce in a large metal bowl until combined, then pour mixture over the chicken winglets and toss to coat evenly. For deeper flavour, cover to marinate for 24 hours in the fridge. The marinate is still great if made just prior to cooking. Preheat the oven to 200°c and place the marinated chicken winglets on lined baking trays. Bake for 10-15 minutes, or until a golden crust forms over the winglets. Serve immediately, garnished with crushed salted peanuts, coriander, and celery leaves. Serve shredded carrot, chilli and ginger mixed in a bowl on the side.